With back to school upon us, we want our kids to be as ready as they can be. We also want them to have as much fun as they can both in and out of school. Learning can be fun, and is easily incorporated into play. Having mom and dad around to share learning time and help and encourage children grow will let your children thrive and feel confidant as they had back to school this year. ALEX toys, favorites of ours, make going back to school fun and easy. Check out some of the awesome items they have for your little ones! We love this! We took it with us on a recent road trip to Maine and Canada, and my son used it in the car and in restaurants. “Learn to write A,B,C’s and numbers with ease! 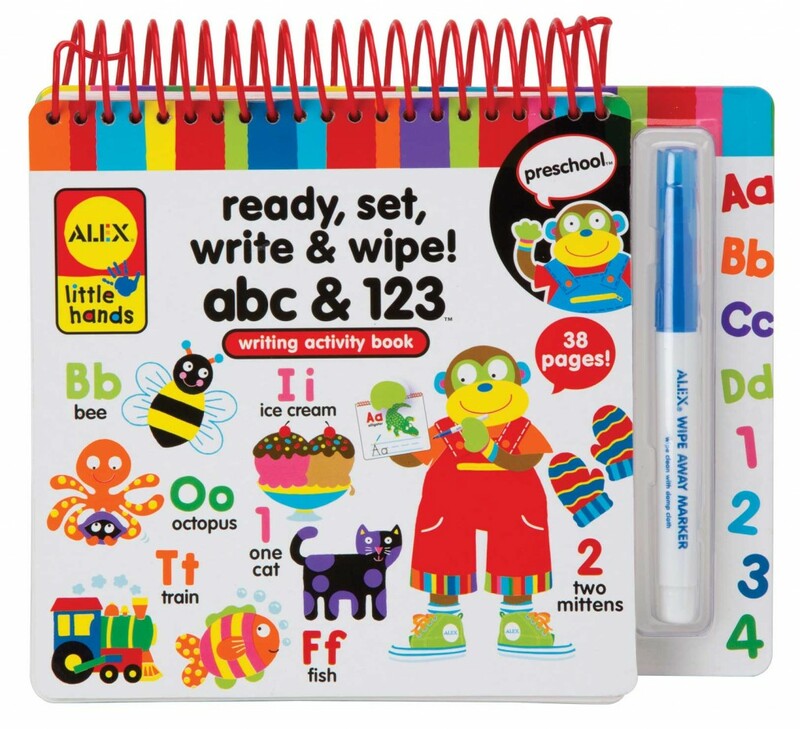 This spiral-bound pad contains 19 pages of numbers and letters that wipe away for lots of practicing.” It is perfect for practicing your letters and getting to know them, or for older children like my son, getting better with handwriting (which, like his mother, is usually a mess). Ready, Set, Write costs $13.95 on the ALEX site, and is well worth it. It can be used over and over again, as well as passed on to younger siblings. It is aimed at kids aged 3 and up, but can be used by younger if they can grip the pen. The one thing I would watch for is that the pen does stain both hands and clothing if you are not careful. My son is not the best at telling time on any sort of clock or watch- it is a skill we are working on. This kit is aimed at children 4 and up, but again can be used with younger children as well as older. I would have for sure used it for circle time when I was teaching Pre-K, and my son is getting use out of it as well. It sells for $18.95 on the ALEX website, and comes with more then just a clock face. So far, my son likes this set quite a lot. 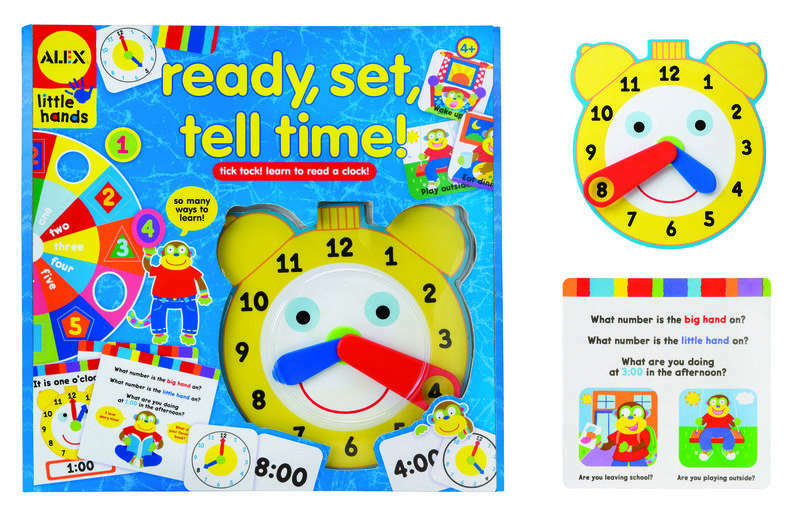 He is still struggling with telling time, but he likes working with the clock and the monkey cards. The different colors for the big hand and small hand help, and they coordinate with the words on the cards which is a nice touch. With more and more schools cutting out classes like art, it is vital that you take them up at home with the kids. Children who are exposed to art are proven to have more confidence, creativity, have more empathy, be overall more intelligent, and do better in other subjects. Why not? The My First Mosaic kit is quite a lot of fun, and only $11.95. Aimed at children aged 3 and up, older children will find it fun as well. 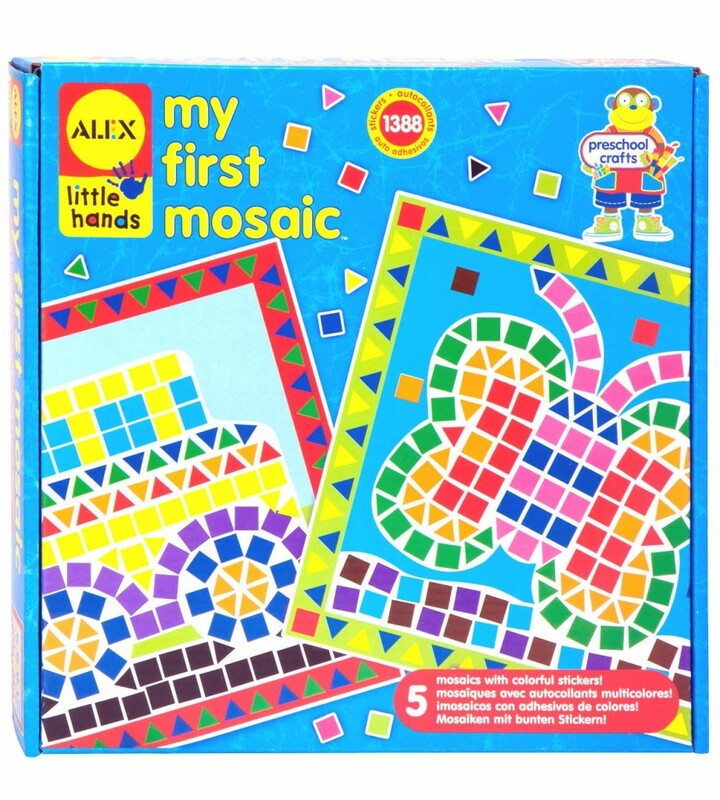 My son loved this kit, and we plan to “step it up” and try a more challenging mosaic next with tiles and clay- he was inspired and feels creative. The kit is so much fun and easy to use, and children feel rewarded when a “picture” emerges from the stickers. If you would like to win a kit of back to school fun just like the one above, please feel free to enter using the RC form below. Thanks and good luck. Ends Sept 30. I would give this to my nephew and he would love it! I would give this to my daughter as she is just now starting to learn how to tell time. She would love it! I would give it to my daughter as I’m sure that she would love it. Thanks for the chance. Hope to win. Would donate the prize during Christmas. These toys would be for my grandchild. Thanks for the giveaway! I am excited. I hope I win the prize. These would be for my children to share if I were to win. If I am lucky enough to win this awesome giveaway I will give it to my niece Stella for her birthday in November. Thank you for the opportunity to enter to win this fantastic giveaway. I would give this to my niece. She is very arts and crafty. Thanks for the giveaway! I am excited. I would give it to my Grandaughters. I would love to have this for my six year old son, he enjoys this kind of game. I will give this to my son. He loves surprises. Thanks for the giveaway! I would give this to my son and thanks for the giveaway! I am excited. I hope I win the prize. I’d like to win these for my niece. Thanks for the giveaway! I am excited. I hope I win the prize. I would give this to my granddaughter for Christmas. She is in 1st grade and would love the activities. I hope I am selected for the prize. thanks so much for the giveaway i would love to win these for my grandchildren. they are the light of my life. and they keep me on my toes. I will give this to my son. Thanks for the giveaway! I am excited. I hope I win the prize. I will donate it to a charity for needy children. Great learning toys. We hope that we win! I am entering hoping to win for my kids. Thanks for the giveaway! I am excited. I hope I win the prize. I would love this for my daughter! Thanks for the giveaway! I am excited. I hope I win the prize. What a great giveaway! These would make wonderful Christmas gifts for the greatgrands and/or donations for Toys4Tots. Thank you! I would give this to my niece, if I won! Thanks for the giveaway! I would love to win this for granddaughter. I love giving toys that also teach! It’s never to early for Christmas gift saving, I’d put it away for my niece and my daughter. I would give this to my son! He would really enjoy it! It looks like fun for him. I would love to give this to my daughter Zoey. She is 4 and learning how to write and tell time. Thanks for the giveaway! I am excited. I hope I win the prize. I would give this package to my niece!! It would be perfect. I am excited!! I hope I win this prize. If I won this would be for my daughter. Thanks for the giveaway! I am excited. I hope I win the prize. I would keep this to give to my daughters. They would have a lot of fun with these. I would keep this for my 3 children. We could have so much fun with these great products! This would be for my daughter. This would be great to help her tell time. I’ve tried to explain it and I think I’m only confusing her. She would having fun doing the mosaic too! If I were to win this prize it would be for my daughter. This is a great prize. I hope I win! I would love to win this prize. I would give it to the neighbors. She has three autistic boys. With three kids i know they would all thoroughly enjoy anything from Alex toy company. Thanks for the great giveaway. I would share this with a child in need at Christmas time. I will divvy these up among my three grandchildren. Thanks for the opportunity to win! This would be for my niece. Thanks for the giveaway! I am excited. I hope I win the prize. I would give this prize to my oldest child who would love it. Thank you so much for the chance to win! Its such a great prize. I would use this with my Granddaughter Alice. We do school work everyday. Thank you for the chance!! I would give this to my grandson Brandon. He would love it! I would give this to my niece & nephew because this would be an awesome activity kit on snow days. Thanks for having the giveaway! I would give this to the little girl I nanny for. Thanks for the giveaway! I am excited. I hope I win the prize.